The Double Pass Flue runs horizontally through the water reservoir. Any wood stove or fireplace looses most of its heat through the flue; with this double pass flue system, the heat of the flue actually helps heat the water in the reservoir. The automatic draft system keeps the water in the water tank at a constant 180˚. This water makes heat readily available when your house calls for heat. The water reservoir is surrounded, like a thermos, by a thick polystyrene insulation. Hot water is pumped through an insulated pipe to a heat exchanger unit located in your heating ductwork or through an existing hot water system; radiant floor heat, or baseboard / radiator units. Also, unlike a traditional wood stove or fireplace this system allows for a more constant heat, just as your gas or electric furnace does. Construction of stoves Side wall, bottom and top of water tank is 3/16 inch steel. Tank ends are ¼ inch steel. 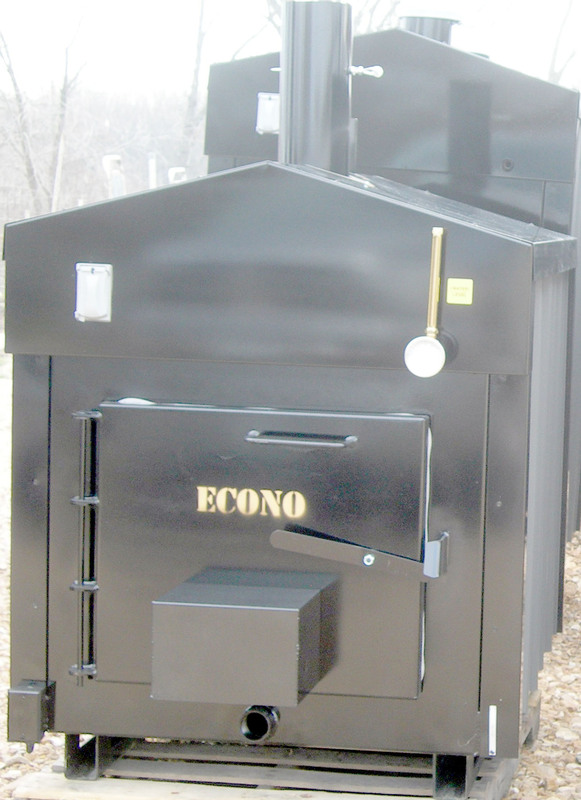 The Fire box is 1/4 inch steel. The fire box and cleanout doors are insulated with refractory cement to keep the heat in. The doors all have 1 inch rope gasket to seal them. 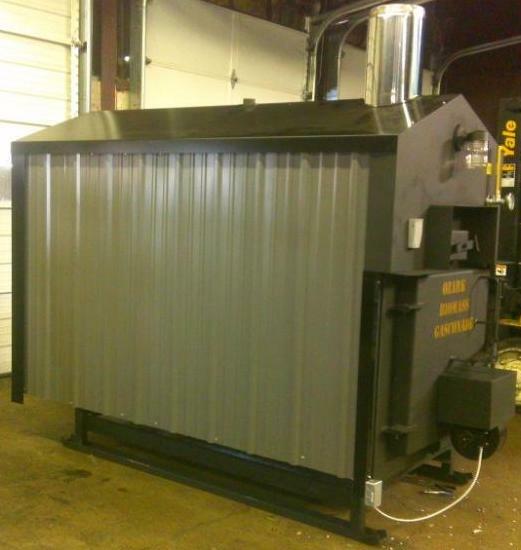 The double pass Flue is a 4 X 12 steel tube. 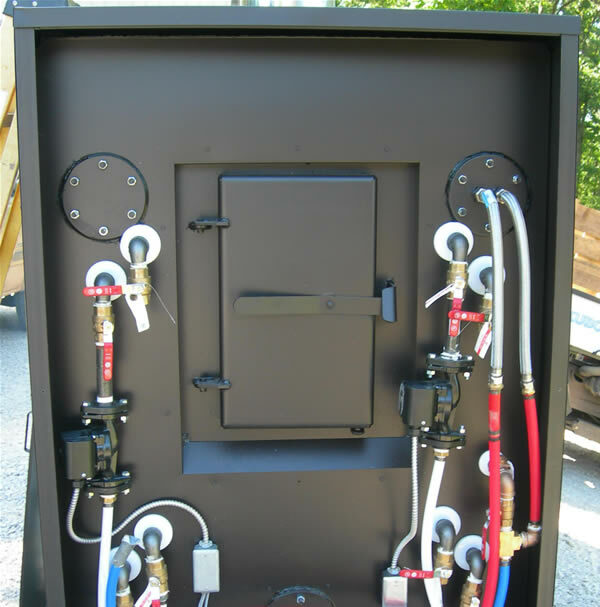 It runs out of the back of the firebox to an easy to access cleanout chamber in the back. 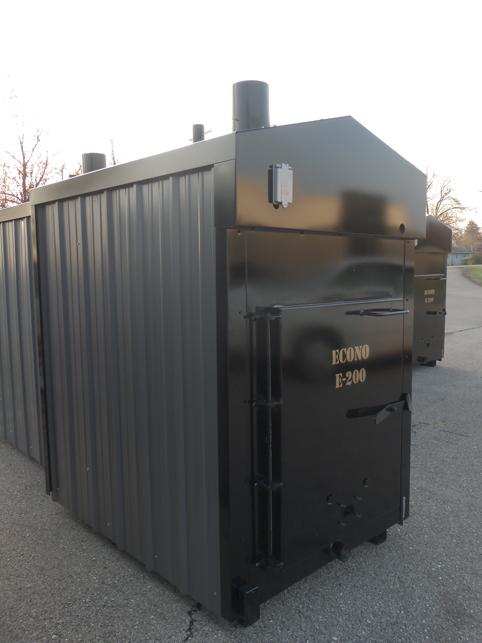 It comes out of the cleanout chamber on the back and goes back to the front to the double wall stainless steel flue pipe on the top. We offer a condensation tank as an option so you hardly ever need to add water to the furnace. easy to clean), and water treatment. The Genesis Units come Standard with a shaker Grate System. Meramec #1 $800.00 50 foot insulated line, pump, flange kit, heat exchange coil, fittings, thermostat, relay, ground rod & clamp. Meramec #2 $1000.00 50 foot insulated line, pump, flange kit, heat exchange coil, fittings, thermostat, relay, ground rod & clamp, water heater valve, and domestic water coil. 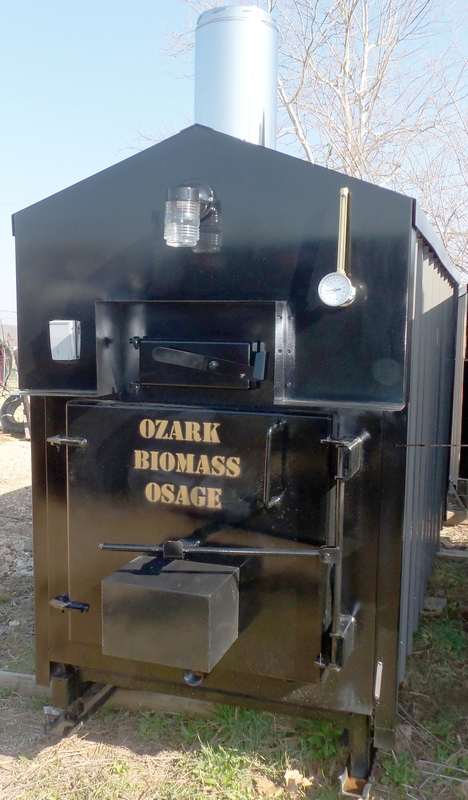 Gasconade, Osage #1 $800.00 50 foot insulated line, pump, flange kit, heat exchange coil, fittings, thermostat, relay, ground rod & clamp. Gasconade, Osage #2 $1000.00 50 foot insulated line, pump, flange kit, heat exchange coil, fittings, thermostat, relay, ground rod & clamp, water heater valve, and domestic water coil. Install Kit #1 $800.00 50 foot insulated line, pump, flange kit, heat exchange coil, fittings, thermostat, relay, ground rod & clamp. Install Kit #2 $1000.00 50 foot insulated line, pump, flange kit, heat exchange coil, fittings, thermostat, relay, ground rod & clamp, water heater valve, and domestic water coil. This unit comes with water treatment, forced draft with automatic damper, aquastat controlled, digital temperature readout, water level gauge, & shaker grate system.